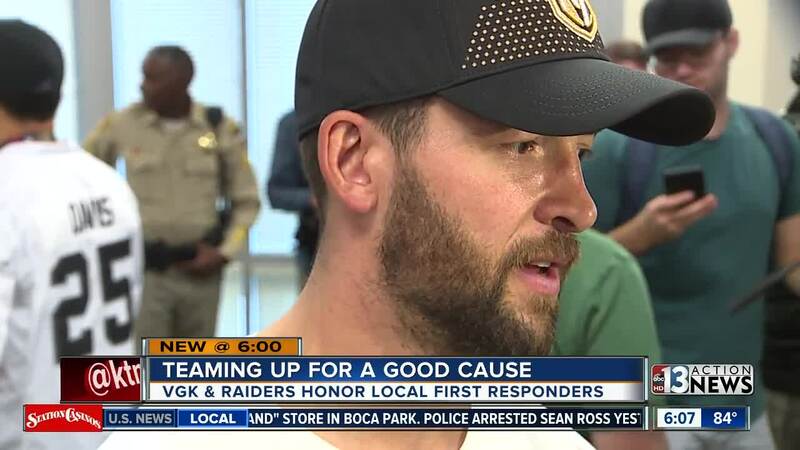 For the first time, players from both the Vegas Golden Knights and the Raiders teamed up for a common cause today - to thank first responders. "We should be the ones lining up to take pictures with them," said Reilly Smith, right wing for the Golden Knights. Just a day after the anniversary of 1 October, players from both teams met at Metro Police Headquarters to take pictures, sign autographs and say thank you to first responders. "They're the heros," said Deryk Engelland. "We're just playing a game and trying to help. They did everything, not us." Engelland said he and his teammates were grateful for the opportunity to meet these local heros. And although the Raiders have yet to play a down in Vegas, linebacker Marquel Lee said he already feels connected to the community. "These guys are our heros, Vegas' heros," he said. "Vegas strong. We support the movement. Our new town coming up. We're glad to be here." The Golden Knights begin their regular season at home on Thursday.